Continuation of the official Monster Energy Supercross licensed game. We take part in supercross motorcycle races against famous riders on tracks full of various obstacles. Monster Energy Supercross: The Official Videogame 2 is a continuation of the 2017 racing game focusing on motorcycle racing. The title was developed by Milestone for personal computers and PlayStation 4, Xbox One and Nintendo Switch. Like the previous edition, Monster Energy Supercross: The Official Videogame 2 allows us to take part in supercross competitions, where we compete on routes full of various obstacles such as thresholds and moguls. With the official Monster Energy Supercross 2018 license, we can compete against more than 80 real 250X and 450SX racers, including Jason Anderson, Marvin Musquin and Elim Tomac. In addition, we have access to official tracks and motorcycle brands. 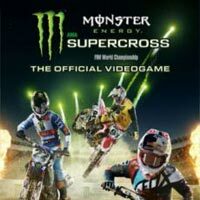 Second installment Monster Energy Supercross: The Official Videogame dramatically develops the formula of the predecessor. The driving model is even more realistic and the obstacles on the tracks are more faithfully reproduced. There are also more than 3,000 items in the game to personalize bikes and players, allowing you to change the look and choose the animation displayed after the victory. In addition, the track editor returns, with new options, a separate tutorial and the ability to share your projects on the web. The creators of Monster Energy Supercross: The Official Videogame 2 provided a more extensive career mode. As part of it, we must take care not only about the results of the competition, but also about relations with fans, rivals and sponsors. In addition, we can take part in single races against riders driven by artificial intelligence or face other players in online mode. Monster Energy Supercross: The Official Videogame 2 is based on the Unreal Engine 4 engine, so the title offers an aesthetic visual setting. Attention is paid to detailed vehicle models and competitors' faces, and the whole is complemented by a solid sound system.